(Santiago de Compostela) In the autonomous Spanish region of Galicia a new equality law against "discrimination against lesbian, gay, transgender, bisexual and intersex people" was effected. The Law 2/2014 cites that regardless of gender, race, religion, opinion or any other personal or social circumstances, Article 14 of the Spanish Constitution affirms the equality of all people. " In reality, this is a law in the service of gay lobby" says Infovaticana. It was put into law with the votes of the Christian Democratic, Partido Popular, which holds 41 of 75 seats in the Galician Parliament. Anyone hoping for a condemnation of the new homo-Promotion Act by the Catholic bishops, waited in vain. "The bishops of Galicia were silent," says Infovaticana . The law expressly recognizes the five sexual special forms as social groups. Companies could be forced to reserve a certain percentage of jobs for members of each of these five groups. Family shall be subjected by the Christian Democratic majorityn to a complete redefinition. 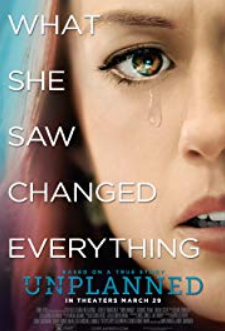 As a family, includes any form of communication between two people or one or both parents with children, whether heterosexual or homosexual, whether married or living together. The new law affects state subsidies, public competitions, job postings, concessions and licenses. The aim of the competent organs of the Comunidad Autonoma de Galiciais, by law, is to promote the various affective-sexual forms, different family models and the equal rights of LGBTI people, referred to as particularly "vulnerable" and therefore in need of special protection. Article 28 defines explicitly, that the "positive" teaching of "homosexuality, bisexuality, transsexuality and intersexuality" is to be encouraged and promote in the culture. In Article 31, the press subsidies explicitly coupled in the benevolent promotion of homosexuality and rejection of " sexist vocabulary", to mention only two passages of the new law. Infovaticana asked all five Galician bishops to give an opinion. Archbishop Julian Barrio of Santiago de Conpostela and thus Metropolitan of Galicia refused to give any opinion. His press secretary finally referred, after obstinate demands, on the scheduled for the end of the month meeting of the bishops of the ecclesiastical province. 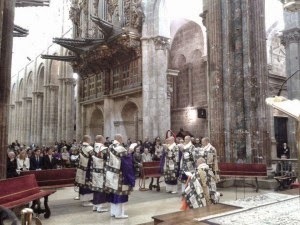 Archbishop Barrio last month allowed the profanation of the Cathedral of Santiago de Compostola by pagan rituals of Shinto priests and Buddhist monks (see separate report Desecrated Cathedral of Santiago de Compostela by Buddhist and Shinto Rites ). Bishop Manuel Sanchez-Monge of Mondonedo-Ferrol was completely surprised, "I knew nothing of this law." He assured he would address the bishops of Galicia at its next meeting with the question: "I assume that we at the first opportunity, when we [the bishops of Galicia] gather a clear position related to the question." Bishop Alfonso Carrasco-Ruoco of Lugo was also not prepared to comment. 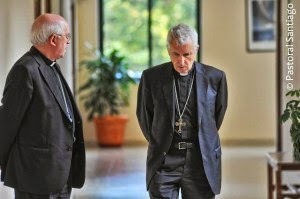 Through his press secretary, he sent word that he would not comment before he had not consulted with other bishops. Bishop Jose Leonardo Lemos of Orense said through his press secretary that it was "on the subject is one of the pending issues to be addressed at the next meeting of the Ecclesiastical Province. Since it is a regional issue, it may be that a joint statement indicating if this is also not safe because they have not yet dealt with the issue. " Bishop Luis Quinteiro of Tuy-Vigo could not be contacted despite repeated attempts. 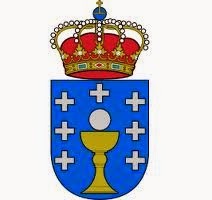 As an aside it should be mentioned that the coat of arms of the Autonomous Community of Galicia in contrast to their legislators, is deeply Catholic. It shows a blue shield a golden chalice and above a silver wafer, surrounded by seven silver, Greek crosses. (Madrid) The famous cathedral of Santiago de Compostela was desecrated by Buddhist and Shinto rites The Catholic Church prohibits in their churches every act of worship of another religion. Through the implementation of a strange rite a Catholic church is profaned, and requires a special rite to fix this desecration. Nevertheless, it came as part of an event organized by the local tourist association "Japanese Week in Santiago", the desecration of the world famous place of pilgrimage cathedral by Buddhist monks and Shinto priests, who presented ritual songs and dances. From the 9th to the 13th of May, Japan was presented in Santiago with a variety of events all year. It featured Japanese art, music and cuisine. On May 13th, the last day of the theme week, the event took place in the Cathedral of Santiago de Compostela called "The Spirit of Japan". The program announced the event as "Songs and Dances of Buddhist monks and Shinto priests of the prefecture of Wakayama." But how is it possible that the cathedral of the Archbishop could permit the Tourist Office to make it available, ​​moreover even for ritual acts of foreign religions? This is what Catholics are currently asking. For the tourist office Santiago de Compostela all religions are equal, so for that reason religious programs can take place in a religious context, specifically Buddhist and Shinto rites in a Catholic church. While Holy Mass was celebrated in the Blessed Sacrament Chapel of the Cathedral, the main nave of the church in front of the main altar was opened to Buddhist monks and Shinto priests for their rites. 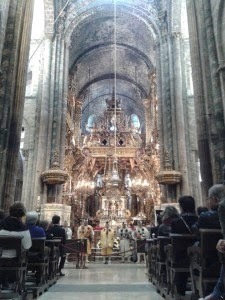 The even was not mentioned on the website of the cathedral church, but without the consent of those responsible, the event could not have taken place. There is also no indication that the procedure required by the Church after a profanation, that is a purification rite, will be performed with a new consecration. Are really all religions equal and a church is only a syncretic container dedicated to fit in all religions? What does Archbishop Julián Barrio of Santiago de Compostela mean by this?